We couldn’t take too much honey from the bees because three of our four hives aren’t fully acclimated yet. We needed to distribute most of the honey from the strongest and healthiest hive to the weaker three colonies to keep all of the bees well nourished. We were, however, able to harvest one comb for ourselves. 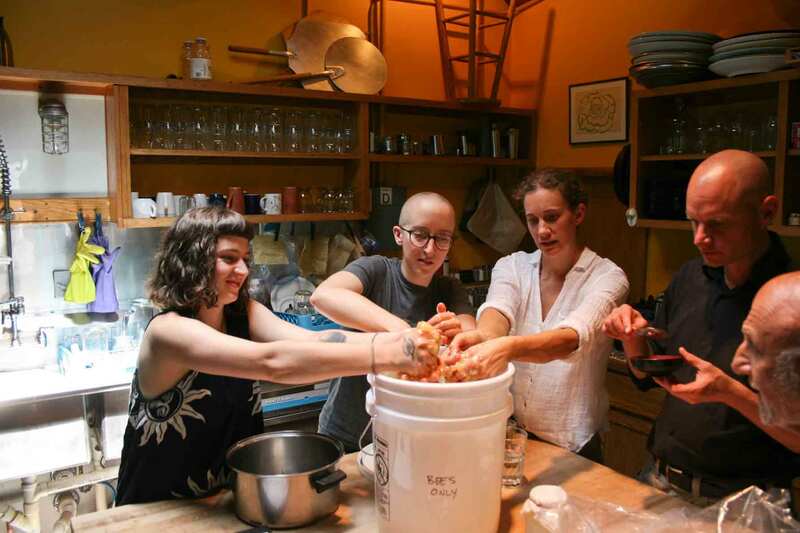 All of a sudden, there was a lot of excitement in our kitchen… our first quart of honey! 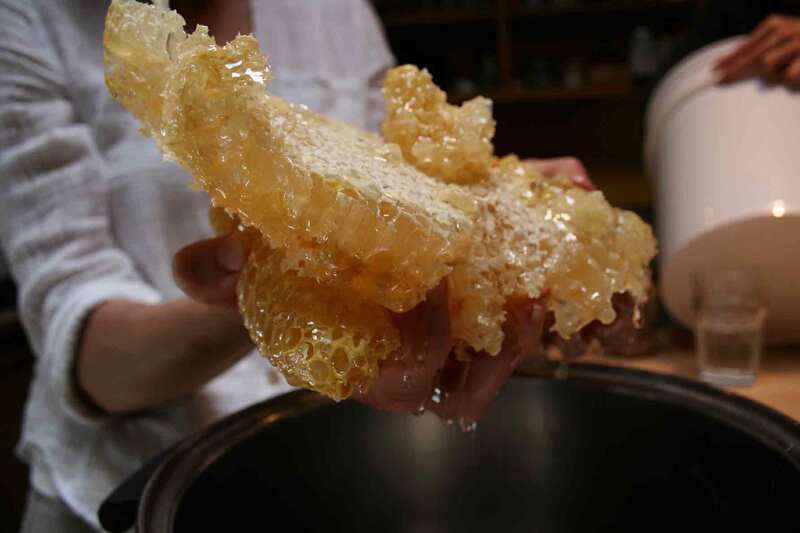 We crushed the honey out of the comb by hand. This heat-free method allows all the enzymes, minerals, and vitamins to remain in the honey. It also keeps all the amazing flavor that comes with pollen and propolis that may be in the comb. And boy is it good! The honey tastes like flowers, like pollen… like real honey! The idea to keep bees at CMZC had been around for while. All of the residents expressed interest. But it wasn’t until this year in the spring when Sophie Dillo, our head gardener, took the leap and made a commitment to lead us in this new adventure. 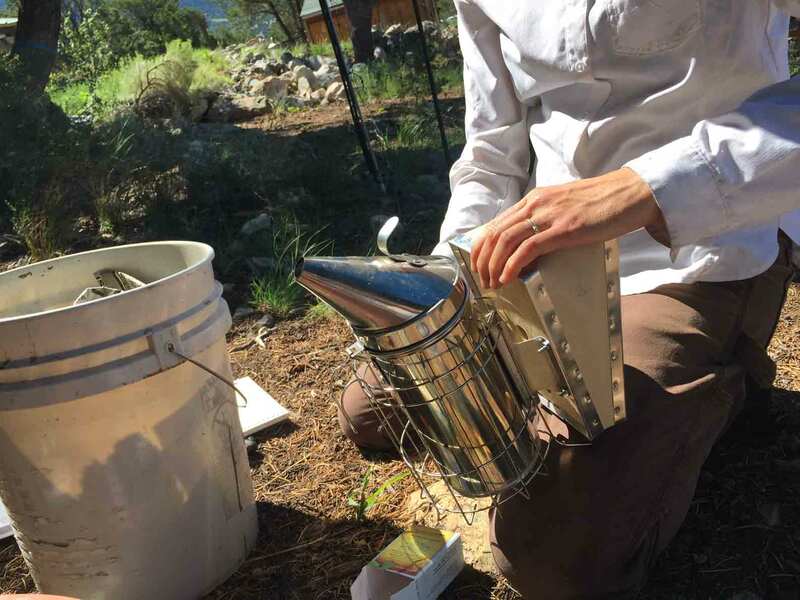 One of our guests last year, Heather Harrell, a professional beekeeper from Taos and co-author of a book on top-bar beekeeping, volunteered to get Sophie and all of us started and be our mentor. We really lucked out; Heather is truly a bee whisperer. 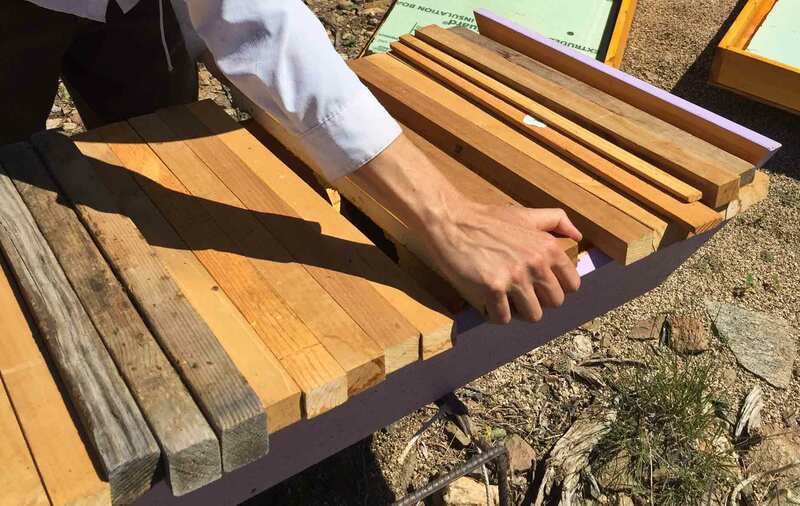 Heather provided us with top bar hives, hive stands, and – very importantly! – a bear fence. 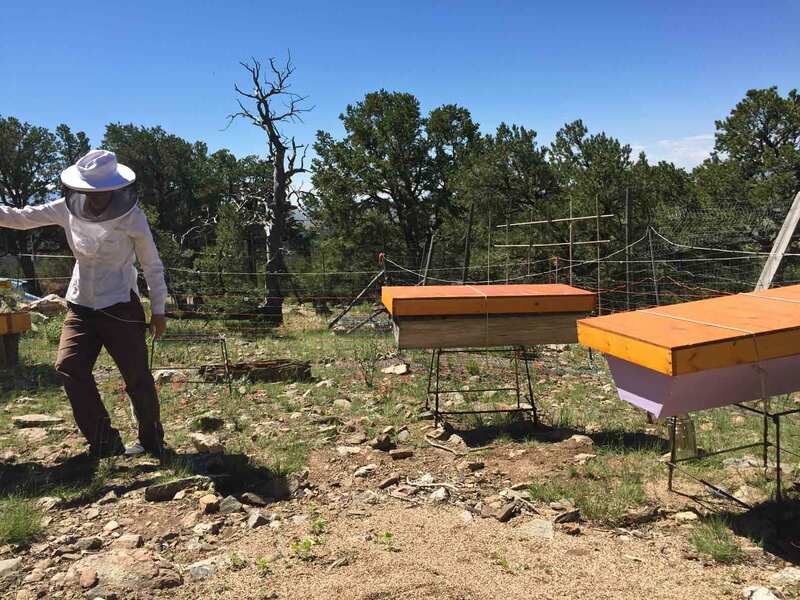 Top bar hives are different from the Langstroth hive you may be used to seeing, which is comprised of stacked rectangles with rectangular frames that guide the comb-building. In top bar hives, the combs hang loosely from the bar, which requires more observation and awareness from the beekeeper. The advantage: the bees are less exposed when the beekeeper opens the hive. 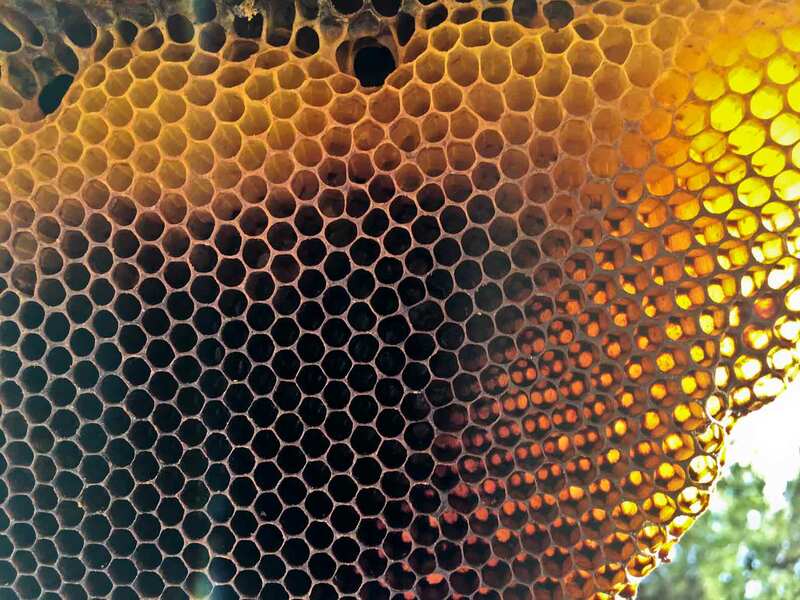 And the bees build thicker combs, which provides more wax when the honey is harvested. 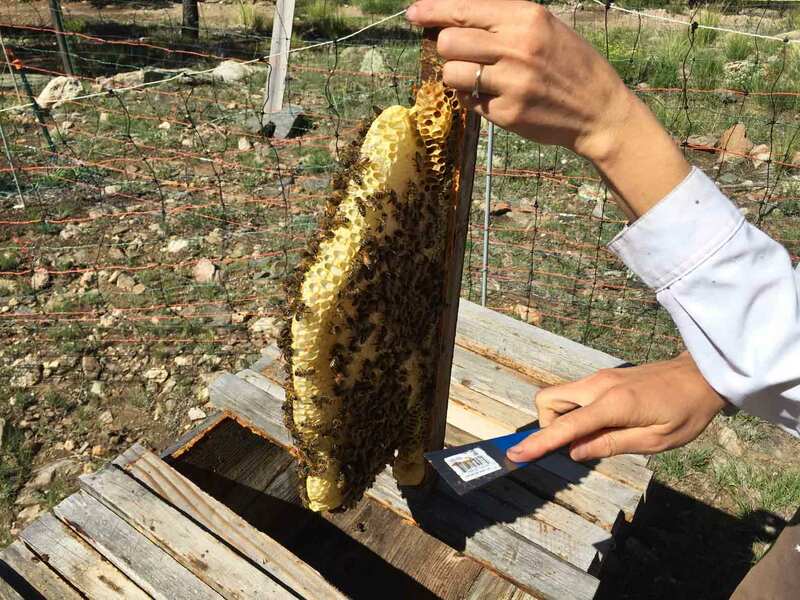 In May, we picked up our bees on the Front Range from different sources to have some genetic variation. Unfortunately, the bees had a rough start. They arrived in Boulder via truck in the midst of a snowstorm, and right after being moved to Crestone they were exposed to a sudden cold snap after unseasonably warm weather. Many bees were moving sluggishly or dying for reasons not apparent to us. Luckily a local beekeeper couple, José and Sandy, coached us through the crisis. Sophie learned how to feed the bees and get them through the rough time. One hive had contracted a bacterial infection; the other bees were simply starving. 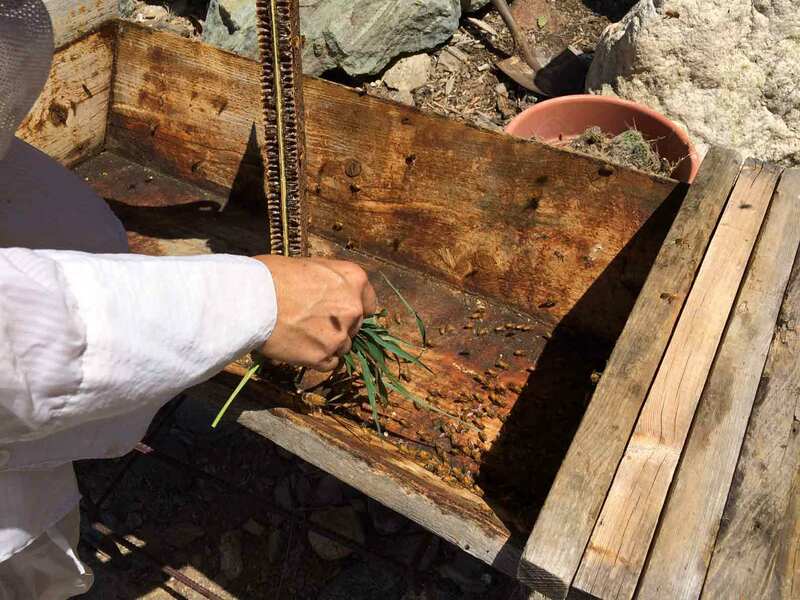 Once the bees regained their strength, they started going out and orienting to their new home, bringing in pollen and nectar from wild blooms in the valley. Currently, the bees are happily foraging in the wild sunflowers and arugula filling our bountiful August garden. This is definitely the height of our nectar flow in Crestone. Sophie has truly caught the bug. 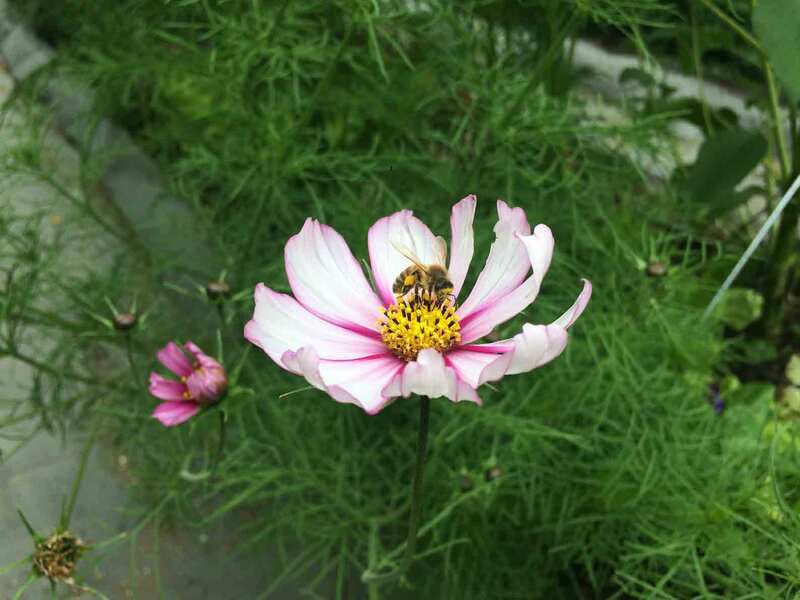 She is enchanted by the activity of working with the bees, describing it as “thrilling.” If you are interested in having bees and have any questions about how to start, feel free to contact her. She will willingly tell you everything she has learned so far and direct you to helpful resources.